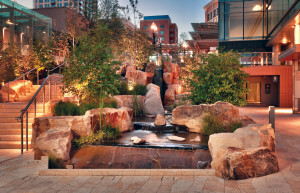 Recreating the feats of Mother Nature, a team of design and stone industry professionals relied on skill, knowledge, and technology to build City Creek Center in Salt Lake City, UT, a 23-acre mixed-use development that has become a landmark for the city. The project features extensive use of natural stone to replicate historic City Creek and create a series of striking fountains throughout the space. 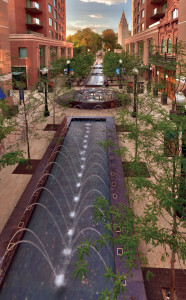 Planning for City Creek Center began in 2006, and the grand opening occurred in the spring of 2012. One of the main attractions of the project is an amazingly accurate replica of City Creek, a spring-fed stream that begins in nearby Wasatch Mountains and originally flowed through what is now downtown Salt Lake City when settlers arrived in 1847. For 60 years, the city developed around City Creek, and in 1909, the portion that flowed through downtown was redirected underground to facilitate urban planning. 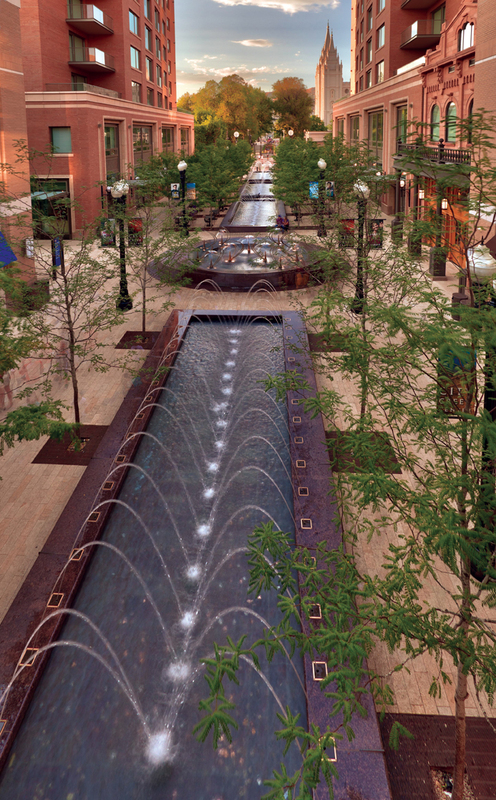 Though the actual creek remains underground so that the water flow can be controlled, the developers of City Creek Center were determined to return the beauty of the creek to downtown Salt Lake City. Creek Canyon to ensure they understood exactly what the developers wanted to re-create. 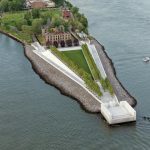 The final design incorporates over 600 trees, hundreds of native plants, and several natural stone waterfalls — one of which is 18 feet high. Live trout can be found inhabiting this new freshwater creek. The goal of creating a cascading creek to mimic what naturally took millions of years to form required a careful collaboration between SWA Group and the stone installer, KEPCO+, along with the general contractors and stone producers. Mountain Valley Stone, a division of Delta Stone Products, quarried 480 tons of sandstone for the project. These were all excavated from the quarry in Brown’s Canyon, just north of Park City, UT. The largest boulder for the project weighs 22,000 pounds. The granite for the fountains presented challenges from both fabrication and installation perspectives, as the geometry of the stones was very complex. When Utah’s harsh winter arrived, the selected boulders were buried under six feet of sand to protect them from the low temperatures. In the spring, the boulders had to be dug out from under several feet of snow and dirt before they could travel from the quarry to the processor. Often times, the weight of the boulders only allowed for one piece to be carried on a truck at one time. Delta Stone Products utilized 12-foot blades to cut away the backs of the boulders, creating a lighter weight stone. 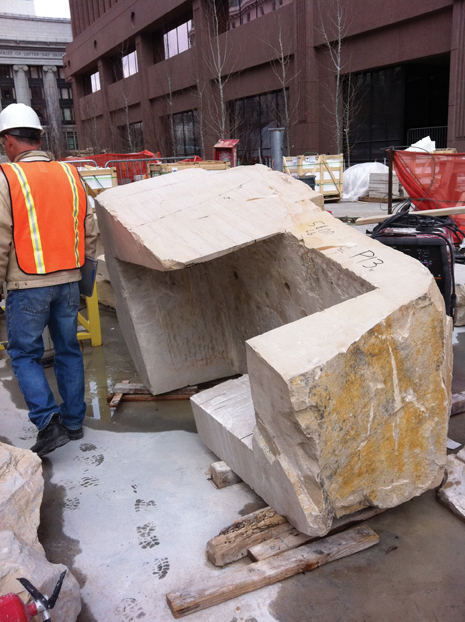 Because so many of the boulders required unique angled adjustments before cutting, a custom-designed, specialized block turner was built by the fabricator to turn the blocks to the exact angles needed. 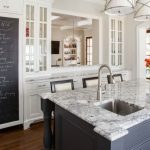 To meet the desired aesthetics, the stone processors crew needed to “unlearn” their level of stoneworking precision. 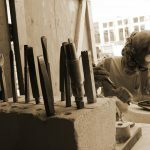 “It was challenging to get the craftsman to understand how important it was to make the tool marks on the stone or the arrangement of boulders/cobble as random as possible to give the rock work a more naturalist appearance,” Nadeau said. Given the complexity and time constraints of recreating City Creek, the use of mock-ups was integral to the project’s success. 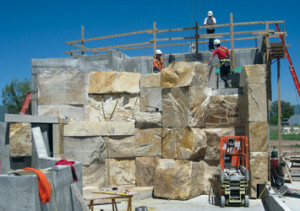 The schedule only allowed six weeks for on-site installation of the main Central Cascade, which would have been impossible due to the amount of hand carving required for each boulder. As a result, KEPCO+ crews constructed the entire cascade at an off-site facility in Heber, UT. Once the mock-up was finished, the massive cascades were dismantled piece by piece and reassembled at the site. Given the complexity of recreating City Creek, along with time factors, the use of mock-ups was integral to the project’s success. In addition to the complexity of the stonework required for the cascades, the downtown construction site presented challenges due to its location. Each boulder was loaded and chained down to a specially designed hoisting frame onto the delivery truck, because the boulders needed to be lifted over the other trade crews and buildings by the tower crane during delivery. Because the tower cranes could not reach the entire area necessary to install the Central Cascade, a 350-ton rail crane was required to move the boulders into position. Some of the largest boulders were installed at the base of this cascade. These boulders were delivered by truck in the early hours of the day, and they were unloaded by crane and hoisted into position one at a time. Each stone was weighed prior to hoisting to ensure they would not exceed the weight limits of the crane. Construction of the cascades took over three years, with over 15,000 production hours logged. The creek stretches over two city blocks, and water is pumped vertically over 25 feet at a rate of up to 200 gallons per minute. 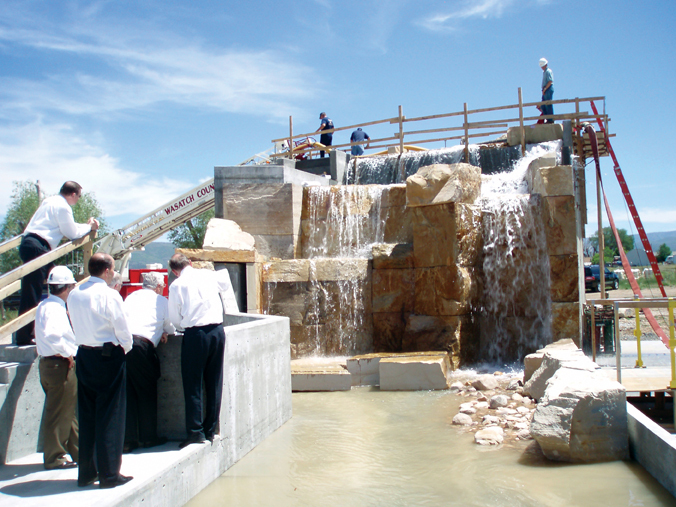 Once the mock-up was finished, the massive cascades were then dismantled piece-by-piece and reassembled at the site. 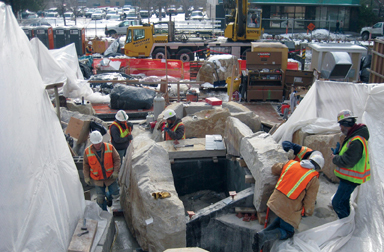 In addition to recreating City Creek, the project also includes seven unique solid stone “fountain experiences.” Six of these fountains feature granite from Coldspring of Cold Spring, MN, including Prairie Brown and Mesabi Black. 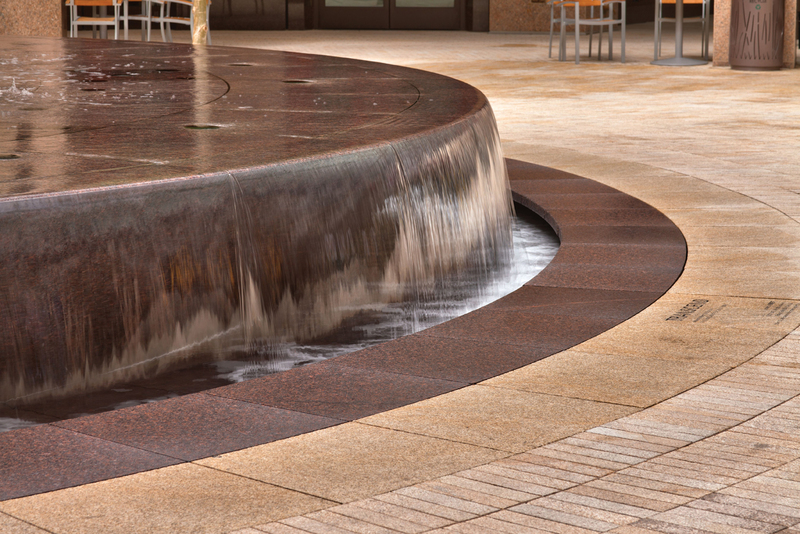 The seventh fountain features Pepper Brown granite, which was quarried and processed in China and supplied by Bestview International of Wood Dale, IL. The same material was also used for paving. 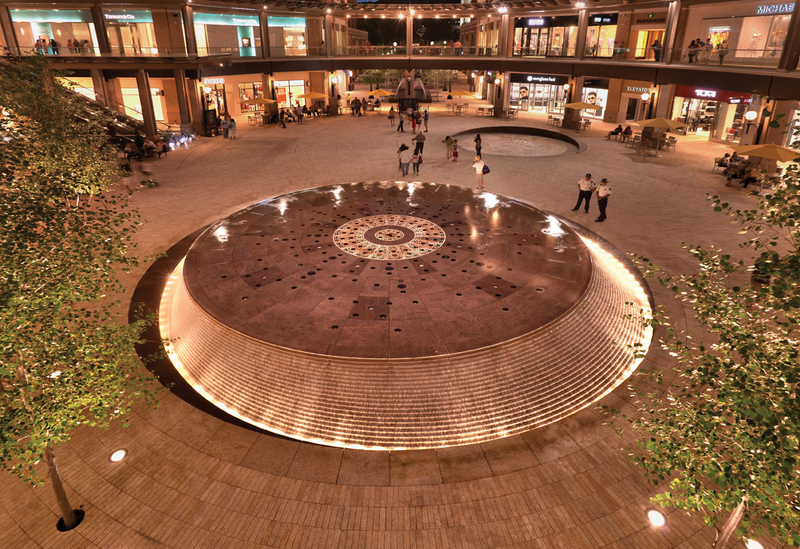 Each of the seven fountains is clad with intricately cut granite elements, and the water flow is precisely choreographed to jump, dance, and move. The fountains also presented challenges from fabrication and installation perspectives. During the installation, KEPCO+ worked closely with the general contractor and the plumbing and electrical contractors to avoid problems in the installation process. Repeated surveys were taken to confirm locations of concrete structures as well as each plumbing and electrical feature. 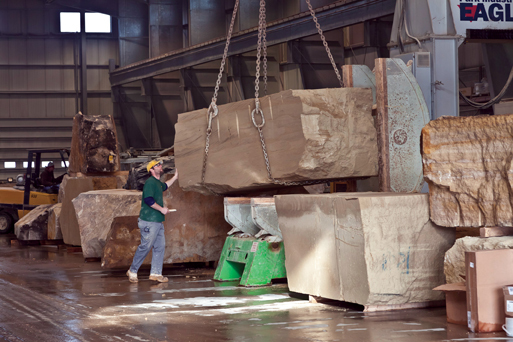 Principle elements of each of the stone fountains were dry set at the fabrication plant or the KEPCO+ facility to ensure that the pieces were cut to precision prior to installation. 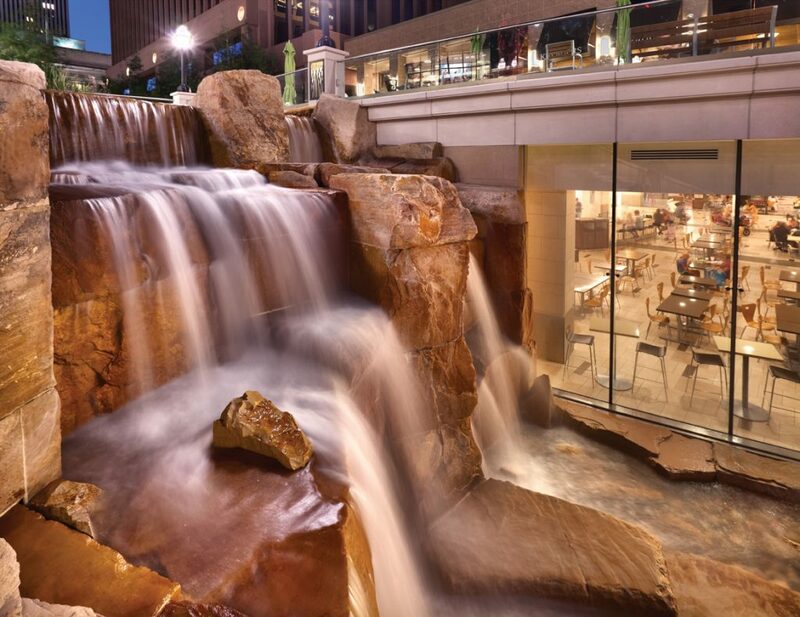 Since its opening, City Creek Center has become a favorite among Salt Lake City residents and visitors alike. It received LEED Gold certification and was named “Best Retail Development” by the International Property Awards for 2012.
the stonemasons to continue their work.